When a young couple brings Helper into their home to assist with the holidays preparations, they soon find that this arrangement was more than they bargained for. Helper’s first task seemed simple enough - decorate the Christmas tree and prepare a festive dinner. It’s clear something has gone wrong when Helper hangs sausages from the tree and places ornaments in the soup! It’s most likely a flaw in Helper’s configuration. 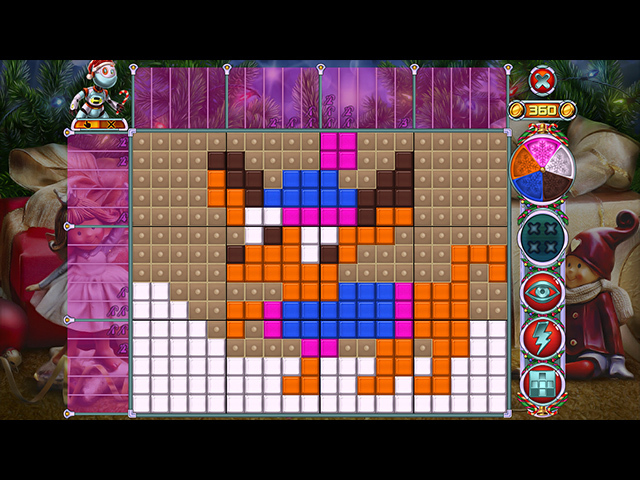 Solve these delightfully festive mosaics puzzles to get Helper on track. 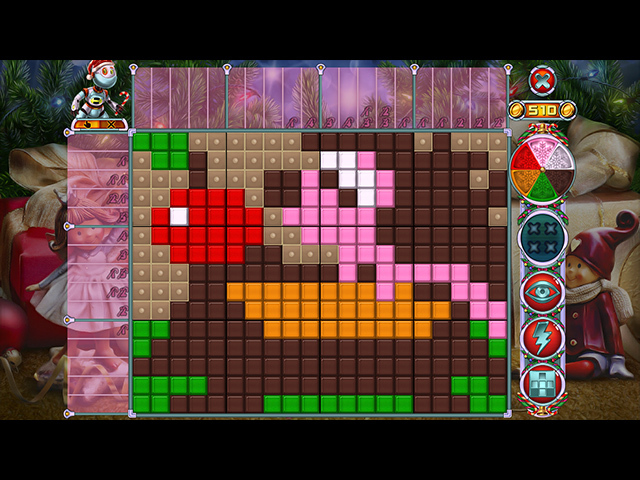 Rainbow Mosaics 10: Christmas Helper is rated 4.1 out of 5 by 8. 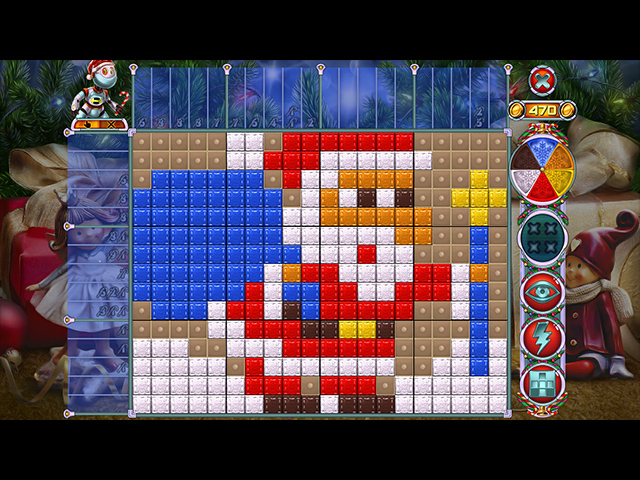 Rated 5 out of 5 by MrsBen from RAINBOW MOSAICS 10: CHRISTMAS HELPER IS PERFECT IN EVERY WAY!! Dear Mr./Mrs./Miss Developer, YOU NAILED IT!! The music is right on, (Please remember that), the graphics are top-notch and the pics are cute as a button! Altogether, it puts me in happy town!! Like a BFG fish named Drgnswf, I'd really enjoy having this type of music with every single game of this type. Your games keep getting better and better! I'm in Heaven!...prematurely, of course. :) Thank you for a job well done!! 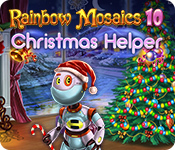 Rated 5 out of 5 by creolo from Rainbow Mosaics 10: Christmas Helper Heh, here is another adventure of ?ute robot Helper. Robot again gets into funny situations and again makes me laugh. As usual the game has good music and nice graphics, and these fascinating riddles will not tear me away from this game! Rated 5 out of 5 by Drgnswf from Music Sails Me Away I love this series and the robot Helper is adorable. The music, however, makes this Rainbow Mosaic the best of all and worth the money because of it alone. It is peaceful and lovely and, consequently, a delight for puzzling/nonogramming (yeah, I know, not a word) folk. Thank you, game-makers, for believing that beautiful music ought to be included and making it such a wonderful atmosphere for this enchanting little tale. Rated 4 out of 5 by funsize2 from too easy I love nonogram puzzle games but the Rainbow Series is just too easy. Even in the upper levels they can be done in less than 2 minutes with no hints or mistakes. I would love to see the Gizmo Series back again. There was some challenge with those. Rated 4 out of 5 by CyndiLouWho2 from Cute robot helper is adorable For once, I disagree with the lower ratings given to a game. Especially since this one has a cute little robot who is trying to help but always seems to fall short. Tiles are bright and you can choose their texture so they look a little more three dimensional. I agree all the solutions aren't about Christmas, they're more about the winter season BEFORE the holidays, as it states in the game's description. So I don't understand the complaints about that. There are achievements to strive for, you can purchase upgrades and you can buy decorations. Solving is strictly logical; I never had a grid where I had to blindly guess. At this time of year when things can get hectic and stressful, I found Christmas Helper to be an enjoyable diversion. Rated 3 out of 5 by Linda_in_Aussie from Disappointing compared to past games I found this version disappointing for a couple of reasons. Hated the music but can turn that off though the previous games had a better soundtrack. Also, some games had absolutely no logic at all and the only way to clear it was to go for hints and that defeats the purpose for me. (In particular game 67 was impossible.) Might have to go back to the penguin I think. I've still recommended it because it is just okay. Rated 3 out of 5 by verimeri from good but for two things Mostly I enjoyed the game a lot. However, most of the pictures I created had nothing at all to do with Christmas. That was disappointing. The main background was very much Christmas which is why I gave it three stars instead of two. Secondly, when I click on system cursor I want system cursor not a smaller version of the cursor you created. Irritating. The robot is cute and funny. I do wish he showed up more than every 20 levels or so. Add in some mini games and this would be a great series.